I made a quick salad using the stems from red chard the other day. 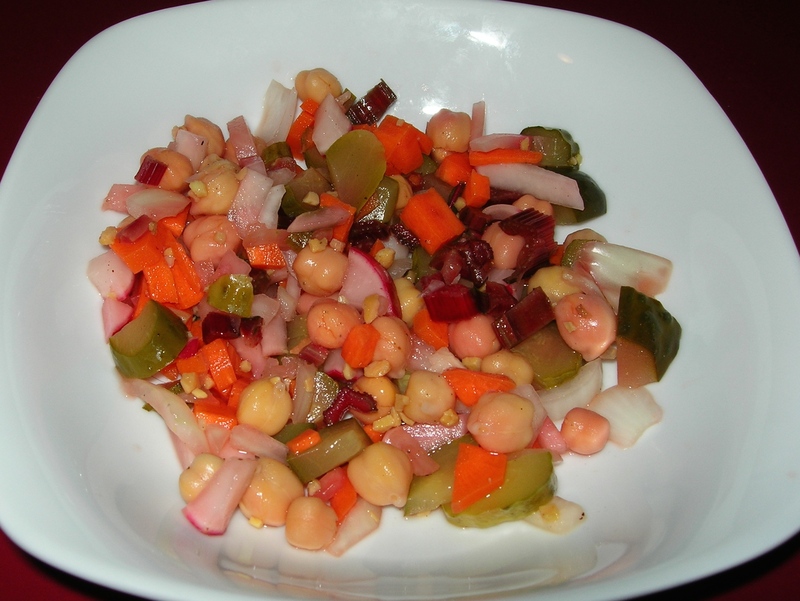 I had a bunch of red chard and had removed the leaves and washed them for a soup I was planning to make and though tossing the stems would be a complete waste, so I chopped them up, chopped up 2 radishes, 1 carrot, half an onion, 3 dill pickles and added a can of chickpeas (strained). I adde dome salt, pepper and about 1/2 cup of the pickle juice and then let it marinate in the pickle juice overnight. It was easy and delicious. Red chard can be very earthy – sort of like beets, but unlike beets they still taste good – and the pickling brine from the dill pickles made a huge difference in mellowing the flavor of the stems. The whole salad was fresh, lovely and crispy. This made about 4 servings.